This evening, as the kids and I watched the “Wizard of Oz’, I had a sudden recollection that ties the generations together for me. The movie came out in 1939, the year my mother turned seven-years-old, and made quite an impression on her. It began what was to be an annual run on American television in 1956. I was five that year, but we watched it as a family every year of the ‘50s from then on. I don’t remember ever not having a TV in the living room; sitting in front of that tiny (by today’s standards) screen in the huge wooden cabinet on the oval braided rug as my mother … either perched on the brown, skirted couch, cup of coffee in hand no matter what the time of day, or standing behind the ironing board with a bowl of starch water at hand … did the ’50s version of multitasking. It was a position I must have mastered very early. Color TV had yet to arrive, so black-and-white was all we knew. Ricky and Lucy’s apartment, Sky King’s sky, everything the Mouseketeers got up to … all were sans any shade but variations on gray. And that was fine … most of the time. The exception to the whole being-okay-with-B&W thing came with the opening bars of “Somewhere Over The Rainbow”. My mother’s WoO had imprinted itself on her brain before the age of television, when films were only seen in ‘movie houses’ where a show cost a dime … unless you wanted to sit in the loges … and grownups could add a bit of atmosphere with clouds of cigarette smoke. 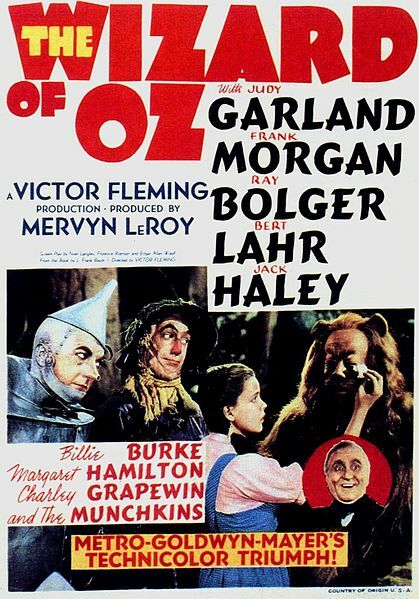 Notable for its use of Technicolor, fantasy storytelling, musical score and unusual characters, over the years it has become one of the best known of all films and part of American popular culture. It also featured what may be the most elaborate use of character make-ups and special effects in a film up to that time. The fact that this beloved experience was reduced for us kids to NO color annoyed my mother no end, apparently, so she did a running commentary to enhance our viewing pleasure … or hers. This is where, all of a sudden, everything goes into brilliant color! That is the YELLOW brick road! Those flowers are poppies … bright red poppies … and are so beautiful. The whole city is GREEN! That’s the ‘Horse of a Different Color’ and as it walks around the color changes from green to purple and more! All these years later, I found myself tonight explaining my mother explaining the colors to me to my kids as they watched a hyper-hued DVD of the road and the witch and the poppies and the horse, realizing as I did that time sometimes moves in circles.